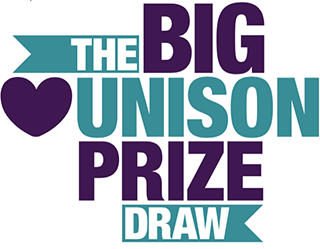 From 15 February until the beginning of May, UNISON will be running a major prize draw – with a top prize of £10,000 cash for the lucky winner. To make it a success, we’re asking branches to visit or contact as many members as possible – particularly those who we don’t already have email or mobile phone details for – to get them to enter. There’s even a range of great prizes for the most successful branches (see below for details). Why is UNISON running this prize draw? Being able to contact members cheaply and easily – particularly using digital means such as email or text messages – could be a vital component of our future effectiveness as a union. If we have a large number of members to contact about their membership (for example if we need to switch them to direct debit), need to hold electronic ballots or get their opt-in to things like the political funds, we will save lots of time and money if people can do this digitally. The starting point for that is always having the right digital contact details for them, which is why this prize draw focuses on just two key pieces of information: personal email address and mobile number. How can I enter members? All branches will be receiving copies of the competition flyer, which contains all the instructions existing and new members need about how to enter. It should start arriving from the 15th February onwards. We are also developing posters for branches and will send these soon. The easiest way to get members to enter is to distribute these flyers to them – this is also the most useful way as you are more likely to reach members who we have no email address or mobile phone information for. An alternative printable paper form is also available, however this is only to be used for members with no access to the internet. What about members that don’t have a mobile number and/or email address? Members without a mobile phone who do have an email address can use the online prize draw entry form. Members without an email address can still enter the prize draw, however branches will need to print the paper form available for download on this site. This is to ensure we have confirmation that they agree to the terms and conditions of the prize draw. What are the branch prizes? To recognise the effort put in by branches, and ensure our branches don’t miss out on prizes, we are going to be rewarding branches with special prizes. A trophy handed out to branch representatives at National Delegate conference and recognition and pictures in eFocus and InFocus. A set of personalised “I was a winner in the big HEART UNISON Prize Draw” mugs. 40 for large branches, 25 for medium, 15 for small. How much is this costing UNISON? The main member prize draw prizes have been kindly supplied by our UNISONplus partners, therefore the cost of the prize draw is limited to the costs in setting up and advertising the prize draw process, and the supply of branch prizes. UNISON has kept costs down by using primarily digital means of processing the entry into the prize draw. However given the costs of text messaging (3p/text) there is a cost in success: the more people who enter, the more it will cost us. However that is generally a good thing to see, so will be worth it! Activist leaflet for members to enter the Heart UNISON Prize Draw. Print this form to give to members who can’t access the internet and want to enter the big prize draw.